Earlier this season, ESPN basketball analyst Jay Bilas handed out midseason honors and singled out the Davidson Wildcats as the best passing team in the country. (Full article here: http://es.pn/2EcWOed). Bilas cited the team’s exceptional passing, putting them ahead of top-ranked teams like Villanova and Kansas. The numbers back up Bilas’s assessment. Coach Bob McKillop’s motion offense has set the pace for a high-octane Wildcats team this season, with almost every possession ending in a good shot because of superb ball movement, with players constantly cutting and setting effective screens. Davidson leads the Atlantic 10 with 17.4 assists per game while producing an assist rate of 62.9%, which is 14th best in the country. 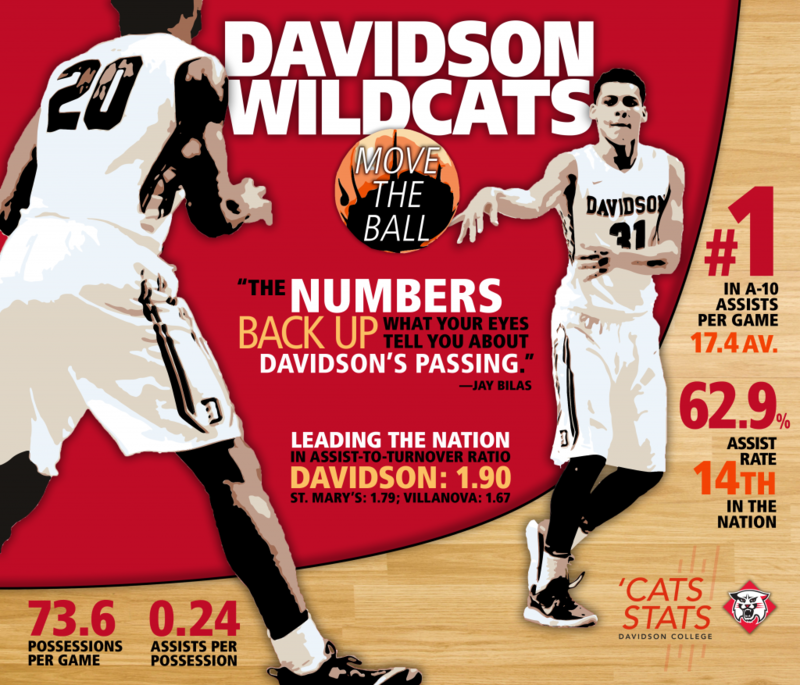 What is particularly noteworthy about this Davidson team, however, is that the assists come from all over the floor. No single player has more than five assists per game. Point guard Jon Axel Gudmundsson leads the way with 4.8 assists per game, with small forward KiShawn Pritchett and power forward Peyton Aldridge contributing 3.8 and 3.1 assists per game, respectively. Not only is this Davidson offense among the leaders in assists, they have limited turnovers. The Wildcats lead the nation in assist-to-turnover ratio at 1.9 while also committing the fewest turnovers per game in the country at 9.2. Freshman shooting guard Kellan Grady ranks third in the country in turnover percentage at a mere 5.5%. Big men Oskar Michelson and Will Magarity have done an excellent job with their ball handling, as they have combined to turn the ball over only 1.1 times per game. An unselfish offense that rarely turns the ball over has led the Wildcats to the 23rd most efficient offense in the country (tops in the Atlantic 10) and the second-best record in their conference. The graphic for this article was created by Allyson Taylor, with analytics supplied by Tyler Brosius. The article is written by Daniel Bunson. Special thanks to Winnie Newton for her insight and support with this project.